The focus of training will be on construction and automation of BioImage Analysis workflows, using as examples more than one toolbox and different exercises. The schools will be held in Edinburgh, 16-19th of October 2018, hosted by the MRC Center for Regenerative Medicine/Imaging facility and co-organized by the University of Edinburgh and University of Dundee. 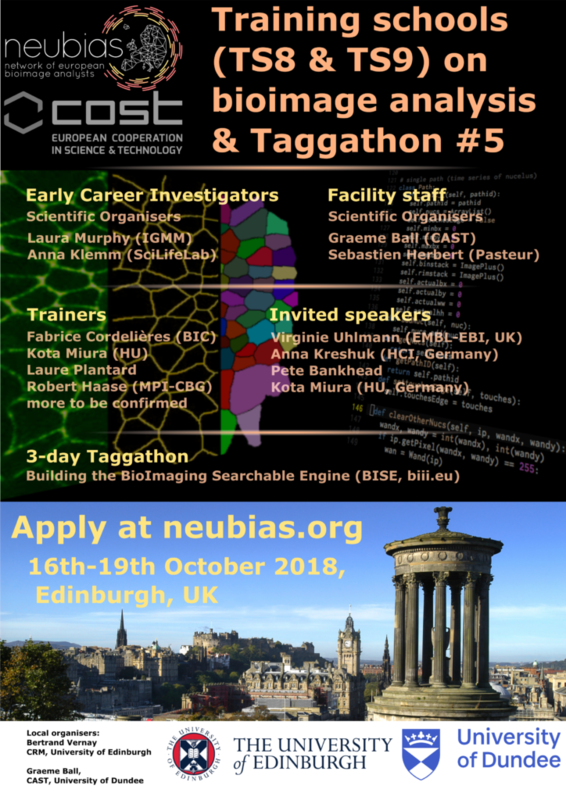 NEUBIAS schools are an excellent opportunity to learn from many experts in Bioimage Analysis (we are expecting >30 specialists at the event) and “….a great mix of intensive learning and community networking” (former trainee testimonial!). The schools will include practical sessions and seminars on ImageJ for analysis and publication, scripting/macros in ImageJ and Matlab, Omero, CellProfiler, QuPath, Ilastik, Ethics in Image Analysis and work on own data. Applicants are highly encouraged to bring their own laptops and data. Within the COST framework (funders of NEUBIAS), 7 travel grants per school are offered to applicants who qualify. Selection notification: 1st week of June 2018. – A training programme for 3 different target audiences:”Early Career” researchers, (core) Facility Staff and Bioimage Analysts (running until 2020 – expected 400 trainees and 15 training schools). – Online Resources: Repository of tools and workflows e.g. biii.eu, Benchmarking and Sample datasets, Training material and Open Textbook. – A Short Term Scientific Mission mobility programme for Scientists to visit Host Labs and get in depth insights into cutting edge Image Analysis technology. – A “ITC conference grants” programme to support travel for Early career Investigators from Inclusiveness Target Countries to present their work at conferences.